We know that finding a quality child care/early learning environment for your child can be overwhelming and time consuming. We know that you want the best for your child – to keep your child healthy, safe and learning while you are away from home. Are you searching for a quality child care center? An in-home/family child care environment? A full-time or part-time nanny? Are you searching for part-time care? 1st, 2nd or 3rd shift care? After school care? Summer camp opportunities? There are many so many choices. Child Care Resource Center (CCRC), your local non-profit child care resource and referral agency, can help! Maybe you need full-time care for your newborn so you can return to your career. Or you may need a half-day preschool program that will help your child develop the social and school readiness skills to begin a successful school career. Or perhaps your school-age child needs a summer camp that reflects his interests and provides care for the hours he would normally be in school. 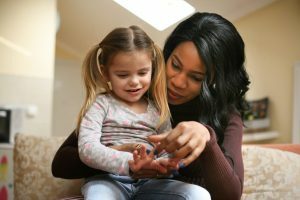 Talking with a parent specialist can help you in your search for a child care arrangement that best fits your child and your family’s needs. Serving the community for 26 years, and home of the largest database of child care programs in the region, CCRC offers a combination of free and fee-based services (including a nanny search service) to suit the needs of all families. We provide the tools you need to make the best decision about child care for your child and your family. In consultation with your CCRC Parent Specialist, you will learn about indicators of quality that you can look for as you visit potential child care programs. You will receive a Parent Tool Kit that provides a list of questions you can ask each child care provider to learn more about their program and how they will care for your child, information about North Carolina’s quality rating system for child care programs and how this system is linked to the quality of care your child will receive. Are you searching for quality child care? Please call (336) 245-4900 or visit www.workfamilyresource.org for more information.